JCU’s Vice Chancellor, the Australian Greens Leader, an acclaimed French jewellery designer and her Australian distributor have joined forces to raise awareness of an extremely rare possum facing possible extinction because of climate change. 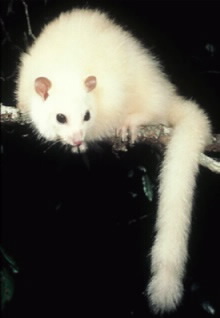 Researchers believe the White Lemuroid Ringtail Possum could become the first creature in the world to be wiped out due to global warming. The species is primarily confined to cool, misty rainforests above 1,100 metres on a single mountain range - effectively an island in the sky - in tropical northern Queensland, in north-east Australia. In its elevated location, it is extremely vulnerable to climate variations, and if temperatures continue to rise it will have no other viable habitat. 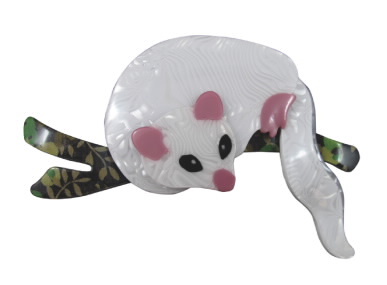 JCU Vice Chancellor, Professor Sandra Harding, raised the threat to the possum with Australian Greens Leader, Senator Christine Milne, who suggested they ask French jewellery designer, Lea Stein to create a brooch depicting the rare, beautiful creature. Co-launching the brooch at the Association for Tropical Biology and Conservation Conference in Cairns, Professor Harding said she hopes it will bolster efforts to save the endangered species. “This possum is becoming an icon of the battle to save vulnerable tropical species around the world. We need to do what we can to raise awareness of the threats facing so many creatures in the Wet Tropics,” she said. Senator Milne said the four women had worked together to help the possum. “This brooch is a tangible symbol of the real and immediate threat posed by global warming. Entire species are at risk but we do have the power to do something about it, by raising awareness and changing laws in the parliament. I look forward to doing both,” said Senator Milne. It’s believed that in 2005, a severe heatwave almost wiped out the northern population of the species. Exhaustive searching located a small number of the animals, and researchers are hopeful the species is recovering. Professor Steve Williams from James Cook University has spent 20 years studying the animal. He said climate modelling shows the possums’ prospects are grim. “This possum really gets hammered by a heatwave and the severity and frequency of heatwaves are continually increasing. The possums’ northern population could disappear with the next severe heatwave, especially if it coincides with a poor wet season. Current climate trends suggest this could happen at any time,” Professor Williams said. Tropical rainforests expert and JCU Researcher, Professor Bill Laurance says in many ways, the White Lemuroid Ringtail Possum is a better mascot for the perils of global warming than the polar bear. “This possum can only survive in a narrow range of temperatures. As such it’s similar to a canary in a coal mine, providing a warning about what could happen to a lot of other tropical animals that will struggle to adapt to rising temperatures,” Professor Laurance said. Lea Stein designs only two brooches per year. The limited edition white lemuroid ringtail possum brooch will go on sale exclusively in Australia, and will be distributed worldwide by the end of the year.